Actually, I started out the day humming ‘I wanna be in the cavalry…’which is really catchy, but I’ve ended up playing ‘Hard on equipment’ about 15 times in row now, just because the song is so gosh darned good. Was that a five eighths or a nine sixteenths? That last line “Jesus Christ” reminds me of my dad. Picture my sister and I sitting watching TV upstairs, my dad downstairs putting lights in the newly finished basement. All of a sudden we hear “gggggggaaaargh” – then silence. I look at my sis, she looks at me. We spend a moment in silence, then I say “You go down”, she says “No, you go down”. This goes on for another 30-40 seconds. Finally, much to our relief we hear “JEEESUS CHRIST” in my dad’s voice booming from the bowels of the house. So, we figure, if he can curse he’s OK, and went back to the Flintstones. 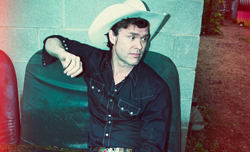 Hurtin’ Albertans is Corb Lund’s touring band. In 2006 Kurt Browning, performed a figure skating routine to “Expectation and the Blues”. In 2009 Lund signed with New West Records, home of Dwight Yoakam, Steve Earle, Kris Kristofferson – keeping company with alt rock aristocracy.